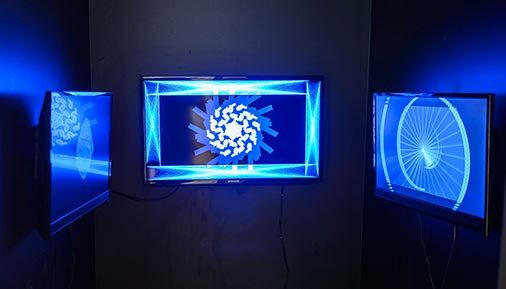 The biannual Fine Arts and Digital Media Faculty Exhibit will be on view Nov. 1 through Dec. 1, 2018 in the Teaching Gallery at Hudson Valley Community College. The exhibit features work by 13 faculty members, as well as talks by four of the artists. The opening reception will be Thursday, Nov. 1 from 4 to 6 p.m. on the Troy campus. Participating artists are Justin Baker, photography; Ryan Chase Clow, photography; Milt Connors, photography; Tara Fracalossi, photography; Kyra Garrigue, video; Richard Garrison, painting; Benj Gleeksman, graphic design; William Jaeger, photography; Thomas Lail, sculpture, drawing and silkscreen; Julie Pamkowski, photography; GG Roberts, painting; Linda Ryder, prints, and Jason Kates van Staveren, photography. The reception and artist talks are open free to the public. Gallery hours are 10 a.m. to 4 p.m. Tuesdays, Thursdays and Fridays; noon to 7 p.m. Wednesdays; noon to 4 p.m. Saturdays, and closed Sundays and Mondays, and Nov. 21-25. The Teaching Gallery is located on the ground floor of the Administration Building. Teaching Gallery exhibits are installed and assisted by students in Gallery Management courses with support from the Department of Fine Arts, Theatre Arts and Digital Media, the Cultural Affairs Program and the Hudson Valley Community College Foundation.